Emailed to me on Tuesday, June 10, The Pokémon Company International has revealed that the remakes of the third generation of Pokémon games, Pokémon Omega Ruby and Pokémon Alpha Sapphire, will launch in the US on Friday, November 21. A European release is slated for the following week on Friday, November 28. 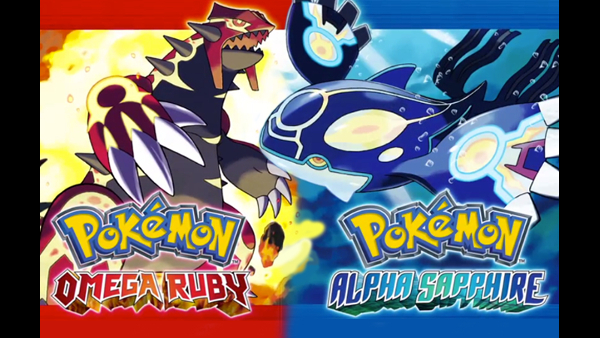 Furthermore, the redesigned Legendaries of the third generation--Groudon and Kyogre--that appear on each game’s cover have been revealed as Primal Groudon and Primal Kyogre (Pokémon Omega Ruby and Pokémon Alpha Sapphire respectively). Similar to transforming regular Pokémon into their Mega forms, Groudon and Kyogre take on their new forms as part of the newly announced Primal Reversion, which is the new transformation sequence that both of the Legendaries can undergo. Be sure to check out the new trailer that showcases the new Primal forms (as well as some gameplay footage) via the embedded video below. Stay tuned for more E3 coverage throughout this week.